Just 2 games involving New York Ranger and New York Islander prospects on Thursday evening, one was a classic full of everything that makes hockey so much fun to be a fan of. The other was a maddening display of a young players inconsistent play. The classic was the second semifinal of the NCAA's Frozen Four featuring Ranger prospect Brady Skjei (2012 1st) and Islander prospect Taylor Cammarata (2013 3rd) of the Minnesota Golden Gophers as they took on long time rival North Dakota. Two teams with a long tradition of playing for championships showed why they are two of the top programs in the USA. This game had everything from solid defensive play, end to end offensive action, great goaltending and best of all an officiating crew that let both teams play missing maybe one call the entire game. This one if it had not been decided by a goal at 19:59.4 of the 3rd period might still be playing as that was how close this game was. A scoreless first period which was as even as you can get featured two very talented goalies starting with Adam Wilcox of Minnesota (who if there is any justice should win the Hobey Baker) and perhaps the only goalie who uses his head to make saves more than Henrik Lundqvist in North Dakota's Zane Gothberg. Both goalies showed solid glove hands and strong stickwork as they made scoring goals almost totally impossible. In the second period, the game opened up offensively as it was like each team tried to top the other with their offensive chances. Pretty sure Brady Skjei spent some time wondering how Gothberg stopped his shot from the high slot through traffic. The second ended scoreless with both teams having 12 shots each and the same number of solid scoring chances. North Dakota though got caught for "Too many men" once and should have been called at least one other time. Still it is hard to argue with the way the game was called. In the 3rd period all of the scoring for the game took place and if you add up the scoring plays that it took up a combined 40.4 seconds for 3 goals to be scored. Minnesota broke through first when a broken play led to the game's first goal at 10:51 of the period. The lead would last for all of 32 seconds as North Dakota would come right back on the attack and Wilcox made perhaps his only mistake when he left too much room on the left side of the goal for North Dakota's Connor Gaarder to punch in his own rebound to tie the game at 11:23. The game appeared destined for overtime when Minnesota's Mike Reilly was called for holding with 1:39 remaining in regulation. North Dakota had a couple of chances to score but Minnesota held them off. There was one last faceoff in the Minnesota defensive end and the puck wound up on the side board but Brady Skjei got to the puck first and he pushed the puck up ice out of the zone. Pretty sure Skjei wasn't planning a shorthanded scoring chance and was just trying to clear the zone. The puck wound up on Minnesota's Kyle Rau's stick and Rau would get the puck to Justin Holl who with the clock running out fired a perfect shot that got the right side of the goal and was in. The goal was of course reviewed and it was determined it was a good goal with 0.6 tenths of a second left on the clock. 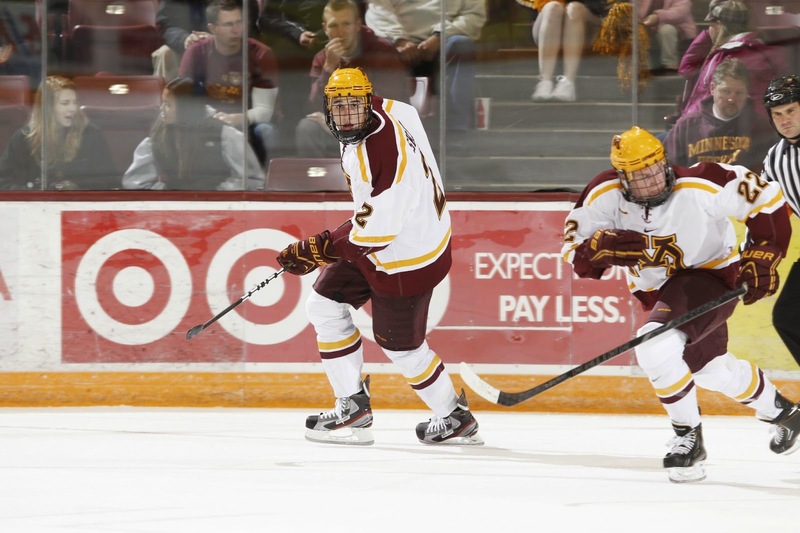 It was Justin Holl's first goal of the season with the assists to Kyle Rau and Brady Skjei as Minnesota earned a 2-1 win along with the date on Saturday against Union College for the NCAA Championship. Skjei's assist was his 8th of the season and gives him 14 points on the season. Skjei was also a +2 on 1 shot as he gets a chance to win an NCAA Championship. Islander prospect Taylor Cammarata like most found open space hard to find as he finished scoreless with no shots and a -1. Jake Bischoff (NYI 2012 6th) was a healthy scratch. In Kootenay, Mackenzie Skapski (NYR 2013 6th) was lights out almost perfect on Wednesday but on Thursday the Kootenay Ice goalie found himself yanked after yielding 4 goals on 18 shots. Skapski was pulled at 16:08 of the 2nd period after the Medicine Hat Tigers had scored to take a 4-1 lead. Lucky for Skapski was that a fluke play just seconds after being yanked led to a Kootenay goal to make it 4-2 as it started a run that would lead to 6 unanswered goals in total as Kootenay would win 7-4. The Ice now hold a 3-1 series lead as the series shifts back to Medicine Hat on Saturday. But the concern has to be Skapski as he simply has not been able to put back to back efforts during the playoffs. Kootenay coach Ryan McGill has a tough decision to make as does he go with Skapski who McGill has been perhaps way too loyal or does he turn to rookie Wyatt Hoflin who after the win is 4-0 with a 2.62 goals against. In my book I give the start to Hoflin who won 3 games against Calgary in the first round and even though Skapski is a Ranger prospect hasn't played well enough to keep his job.